[outside covering of the crown of a tooth] is the hardest substance in the human body, undue stress on your teeth may cause them to crack. Causes include chewing hard foods [such as a popcorn kernel], biting on ice cubes, biting on a hard object such as a pen or pipe and/or clenching or grinding your teeth [bruxism]. To determine if a tooth has developed a crack that is not visible to the naked eye, the dentist will take a through dental history including history of trauma to your teeth and history of any bite adjustments that were performed. The teeth in the problem area will be examined with a dental explorer. Hot and cold sensitivity of the teeth will be tested. If a severe pain is elicited with temperature, and the pain rapidly subsides with removal of the stimulus, it is usually indicative of a fracture. Sometimes, transillumination [light source] with magnification is used to help visualize the suspected crack. The diagnosis can be further confirmed when the dentist uses a plastic or wooden instrument or cotton roll that rests on one part of a tooth while you are asked to bite down. Pain in a specific areas helps isolate the position of the crack. In certain instances, removal of a restoration [filling] may be necessary to visualize the crack and assess its potential to harm the pulp [nerve]. Can cracks be treated so that the tooth can be saved? Yes. Unfortunately, cracked teeth don’t heal themselves like your bones. Early diagnosis leads to a better chance of success. 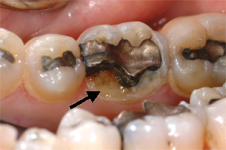 The best solution is to have a full crown [cap] placed over the tooth to strengthen and hold the tooth together. In about 10% of cracked teeth, the nerve dies and root canal [endodontic treatment] will be required, along with the cementation of a post into the nerve canal before the crown and be completed and the tooth restored. Call our office for questions or to set up an appointment if you are experiencing any of the cracked tooth symptoms.